I haven’t been to the London Art & Design Show but will go this year. Entry is £4.50. The glass platters you can see on the flyer are made by Aline Johnson. She’s a fantastic glass designer and likes to fuse glass together to make vases, light fittings & glass panels. I bought a vase by her for a wedding present a few years ago. I love her wall lights, but you know I’m a huge sucker for stripes, so why wouldn’t I love them! 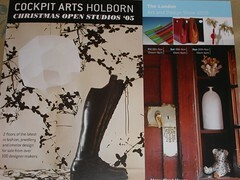 The Cockpit Arts open studios are days when you can meet the designers and artists and your admission helps to fundraise and support designer-makers in London.